Seems appropriate that I would start a blog and announce a new Web 2.0 site at the same time! This week was a big week for DigitalChalk, and fun and engaging online multimedia site! 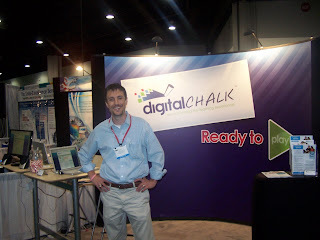 On Monday at the ASTD conference in Atlanta, DigitalChalk was publicly announced and advertised for availability to the marketplace. I have been working on DigitalChalk with a great team for a little more than 6 months and it is exciting to finally see it publicly available. A HUGE thank you to our beta customers who made this launch possible and to my teammates for all of the long hours of coding. You can check out the site at http://www.digitalchalk.com and let me know what you think. I had a great time talking with all of the exhibitors and attendees at the conference and learning about how DigitalChalk could meet their needs and how they could help us out. There are so many ideas and possibilities. DigitalChalk will evolve quickly. There are new features being worked on everyday and I am excited about what is coming in the very near future... I will let that be a tease for now :-) You can be sure that I will be talking about them here when I am able to, as I am already about to bust right now! 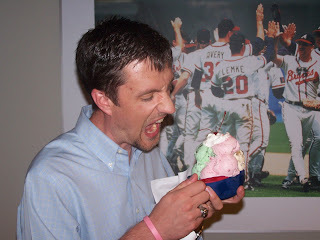 ASTD invited DigitalChalk to the Braves game and I had to have some ice cream! Wow, Troy, congratulations! The website looks great. I look forward to hearing more from you . . .
Looks like the artwork turned out well there at the tradeshow! Good stuff! Congrats. Now we have an Atlanta Braves ice cream hat and a NY Yankee's hat... We need to expand our collection! Next time I'm going with you! I'm getting the hang of blogs (maybe) but I don't understand the need for a braves hat when you already have a Yankee hat. But a great blog! I'm looking forward to hearing and seeing more. I'm stuck in Chicago. Flight to NY yesterday was cancelled. Hope you're having a better weekend than me. I'm glad to see everyone noticed the Braves hat. Troy, your tastes continue to get better over time.